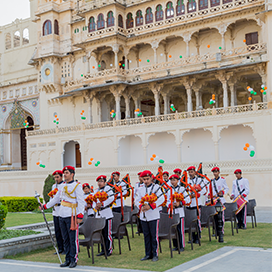 The Maharana of Mewar Charitable Foundation (MMCF), Udaipur was instituted to serve and assist each and every individual to realise a special status in the hierarchy of God's creation, and to serve as a temple of inspiration to future generations. The Foundation was founded upon principles of trusteeship, which are its underlying structure and strength. In 1971, Parliament amended the Constitution, and by this Constitutional Amendment Act of 1971, the erstwhile sovereigns of the states of India, became ordinary citizens of the democratic republic, and their privileges and allowances ceased. From now on they would have to fend for themselves and seek whatever income they might. The most important aspect of this legislation was symbolic. The rulers were reduced by the abrupt removal of that respect which they had earned through centuries of service. Now, amongst other things, they would also be liable to estate duty like anyone else, and their palaces became at a stroke, a vast taxable asset. His late Highness Maharana Bhagwat Singh Mewar, now known simply as 'Mr. Mewar', was concerned, on the one hand, how to make practical sustainable use of all his buildings and on the other, how to continue time honoured and cherished traditions of the House of Mewar. In 1969, he established a Charitable Trust to which he donated the main portions of the The City Palace, as well as a considerable endowment. Thus the Maharana Mewar Charitable Foundation came into existence on the 20th day of October 1969. Its funds derive both from interest on the original endowment and from entrance fees to the The City Palace, Udaipur now a museum open to the public. The scope and reach of the MMCF is vast and embraces all avenues of service to the community that was planned by His late Highness Maharana Bhagwat Singh Mewar. After the severance of the states of India, when Maharajas and the Maharana no longer held the social and civic responsibilities that they were used to, the concept of ‘service to the community' was taken over by the government - by politicians and municipal legislators.The role of the Maharaja/Maharana was forcefully made redundant. The House of Mewar however decided on another course of activity. They decided to continue with their responsibilities towards their people in a manner that would be conducive, and would comply with the curriculum laid down by new independent India. The activities of the MMCF are one such highlight into the enterprise of the House of Mewar. The ornamented arch of a gateway is a Toran. It is a testimony to the successful completion of an act of Dan i.e. philanthropy performed by the Maharanas of Mewar. 'Dan' means donation which is explained in great detail in our ancient scriptures. ‘Dan’ is unconditional. It is given to the deserving and those in need, from legitimately earned wealth, with no regrets and with no intention of achieving fame or expecting favours in return. The Maharanas of Mewar observed the tradition of ‘Dan’ after a successful completion of a pilgrimage or social welfare activities such as building of temples, public service institutions, environmental and ecological works. A special Toran was built to commemorate each of these events. The Maharana of Mewar Charitable Foundation was created by an act of Dan to ‘honour recognition of works of permanent value rendered to society’. Maharana of Mewar Charitable Foundation epitomizes the commitment to ‘pursuit of excellence’. It serves as a 'temple of inspiration' for future generations and further continues the model of sustainability that is ‘Eternal Mewar’. A Shiv- ling was placed on top of the Toran to invoke divine blessings. The lighted lamp in the centre symbolizes removal of darkness. The English Translation of The Motto. The glorious chariot of the Maharana of Mewar Charitable Foundation created by the Suryavanshis shall never come to a halt. Their eminence shall be preserved without interruption by future generations. The descendents of Lord Rama who inherited their legacy from Lord Shiva is like the ‘Eternal Flame’ which will remain inextinguishable even in the severest tempest. The Maharana of Mewar Charitable Foundation, an initiative of the Custodian of the House of Mewar for perpetuation of its core values such as service to society and mankind also serves as a 'temple of inspiration' for future generations and continues the model of sustainability that is 'Eternal Mewar'. Maharana of Mewar Charitable Foundation was registered on 29/8/1975, and a donation of cash amount of Rs. 11 Lacs along with the The City Palace including its contents, was endowed to the Trust. The quantification and or valuation in terms of the immovable and movable properties forming the settlement on these trusts are not an easy venture to establish. Because of the nature of these assets and the assets being a rarity as they are ancient artefacts and monuments, it should suffice for our purpose to say that they are irreplaceable and therefore priceless.